The Nintendo Switch has passable charging solutions for its controllers out of the box, but there's always room for improvement, right? Nyko Technologies has always offered solid charging solutions for various controllers--during the Wii and Wii U's lifespan, Nyko's tech was routinely above and beyond the utility and quality of the official Nintendo offerings. Nyko aims to continue that trend with Nintendo Switch. Nyko has just released the Charge Block Pro and Joy Con Charge Block respectively, each for $19.99. The Charge Block Pro allows you to dock a Switch Pro Controller using a proprietary clip-on dongle, while the Joy Con Charge Block lets you juice up four Joy-Cons at once. Because these peripherals are part of Nyko's Charge Block line, you can connect up to four of them for charging off of a single USB 3.0 power supply. You can even connect your Switch Charge Blocks to a PS4 or Xbox One Block! Check out the video and press release for more info. 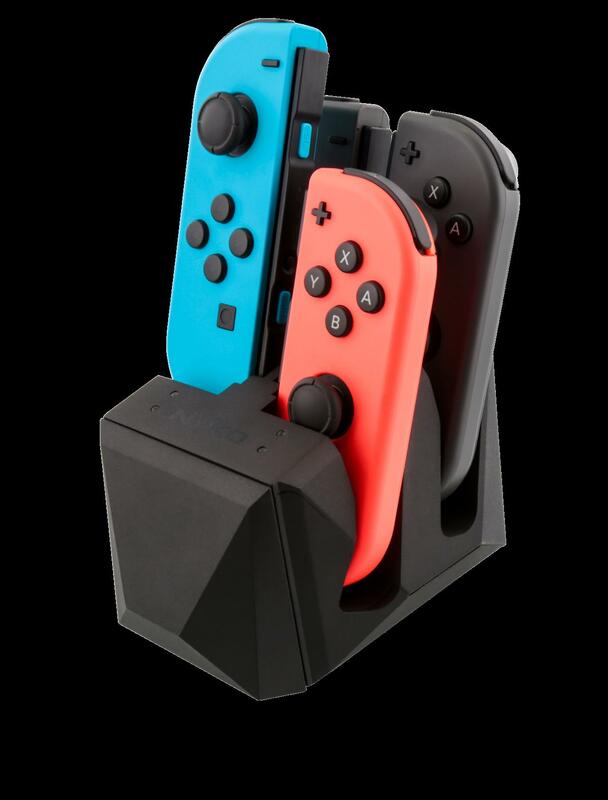 LOS ANGELES - August 15, 2017 - Nyko Technologies, the inventive LA-based video game accessories manufacturer, today announced the launch of Charge Block Pro and Charge Block for Nintendo Switch™, two cross-platform modular charging solutions for Nintendo Switch Pro and Joy-Con™ controllers. Both new additions to Nyko’s Charge Block line easily connect to multiple Charge Blocks from different platforms to create a universal charging system that utilizes a single power source and minimizes clutter. Charge Block Pro and Charge Block for Nintendo Switch are now available for an MSRP of $19.99 each on Nyko.com and GameStop.com, and very soon on Amazon.com. 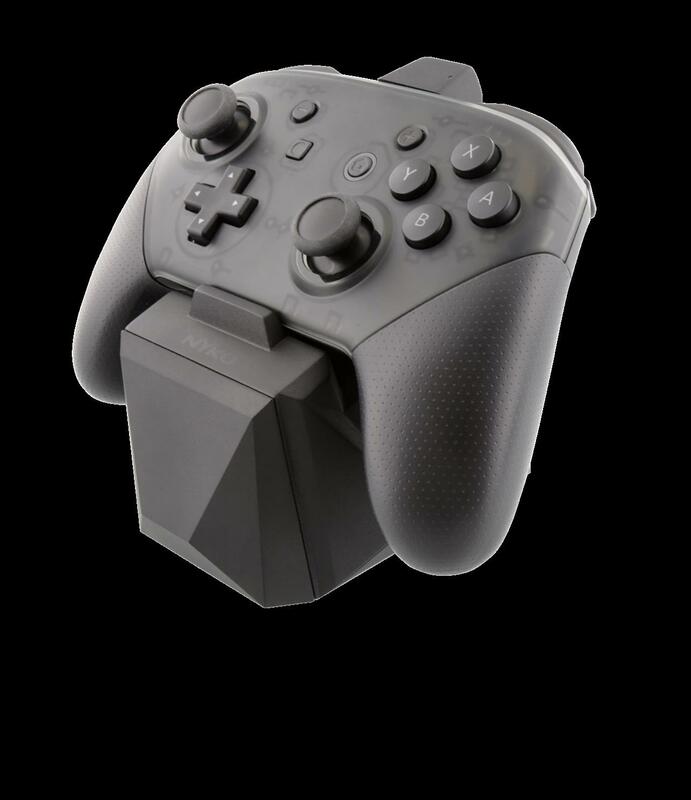 Charge Block Pro utilizes Nyko's patented dongle system that attaches to the USB Type-C™ port on the controller for easy drop and charge functionality, without changing the ergonomics and grip of the Pro Controller. It also features a pass-through window for the charge indicator on the Pro Controller to clearly notify users of the charging status. Charge Block for Nintendo Switch features a rail system that allows users to easily slide and charge up to four Joy-Con controllers at a time, as well as an LED light indicator that signals when charging is complete. Both Charge Block Pro and Charge Block for Nintendo Switch plug into a wall outlet or USB port for recharging, and their low-profile design allows them to easily fit into most entertainment centers for convenient storage.